Despite initial opposition to the construction of the WAGP and current operation problems and insufficiencies, the pipeline is in operation. The West African Gas Pipeline (WAGP), operated by Chevron and owned by the West African Gas Pipeline Company Limited (WAGPco) was commissioned in 2006. Chevron's partners on the project are the Nigerian National Petroleum Corporation, Royal Dutch Shell, Volta River Authority, Société Togolaise du Gaz and the Société Beninoise de Gaz. The onshore and offshore has a total length of 678 kilometers that transports gas from Nigeria to Benin, Togo and Ghana. 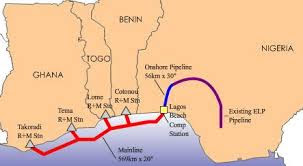 It is linking into the existing Escravos-Lagos pipeline at the Nigeria Gas Company's Itoki Natural Gas Export Terminal in Nigeria from where it proceeds to a Lagos beachhead. Then it moves offshore to Takoradi, Ghana, including gas delivery laterals from the main line extending to Cotonou (Benin), Lome (Togo) and Tema (Ghana). Of the approximately 200 hectares land area used by the WAGP, 70% of which lies in Nigeria and over 3,000 households within the Right of Way. The project is said to support the World Bank West Africa Regional Integration Assistance Stratey (RIAS), whose objective it is to create an open economic integrated economic space in West Africa. The WAPG was also meant to compliment the West Africa power market development project, We st African Power Pool (WAPP). Since ECOWAS first proposed the project in 1982, critical voices have emerged. In 2006, twelve Nigerian communities filed a complaint about the WAGP with the inspection panel of the World Bank, “charging the Bank with derelict conduct in carrying out necessary 'due diligence' about the project’s impacts”. Eventually, in 2008, after conducting the necessary investigations, the World Bank, concluded that the project “did not properly identify and arrange for the livelihood restoration of vulnerable people who involuntarily lost assets”, although the plaintiffs stated the report did not go far enough. The pipeline was nevertheless completed by December 2006. Besides, there are complaints by official authorities and private sector actors that the gas promised by the construction of the WAGP is not reaching the partner countries other than Nigeria. FInally, the WAGP would be at risk because of "uncontrolled shipping, sand winning, indiscriminate anchorage, bottom trawling, unauthorised shipping methods, improper disposal of abandoned ships/shipwrecks and offshore construction". Project Details The West African Gas Pipeline (WAGP) has a total length of 678 Kilometers (421 miles), a maximum discharge of 5 billion cubic meters per year and a diameter of 508mm (20 in). WAGP transports purified natural gas to serve as fuel for power plants and industrial applications. 85% of the gas is destined for power generation and remains for industrial applications. Why? Explain briefly. The West African Gas Pipeline is in operation disregarding the environmental and social impacts.